The 300 was one of the new local routes in the Newham area scheme of 1993, initially running round the Beckton area in an almost complete circle from Winsor Park Estate via Strait Road (replacing route 278), West Beckton and Tollgate to the Asda, before shooting off to new territory around Park Avenue to terminate in East Ham. 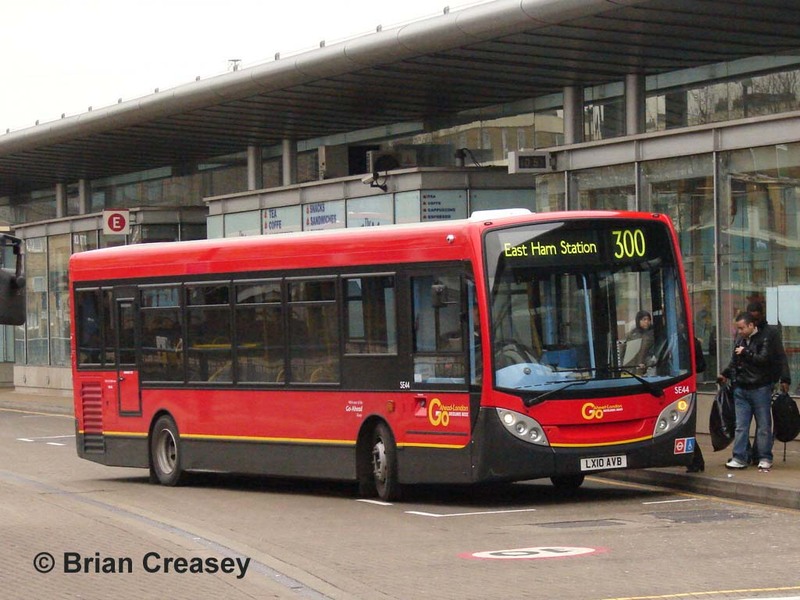 A further re-shuffle in 1999 saw the Strait Road and Winsor Park section transferred to new route 376, the 300 instead unravelling and diverting off to Prince Regent, Plaistow and Canning Town to replace the 276. The route has always been worked by Dennis Darts, and now they are of the low floor variety. The contract was lost by East London to Docklands Buses, now a subsidiary of the Go-Ahead London empire. 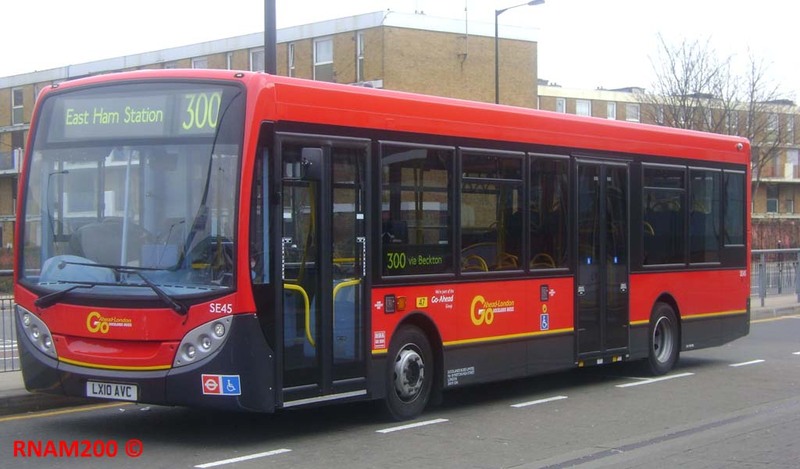 They have obtained new Enviro200Darts, and three photographs are provided here, all made at Canning Town bus station. The first two are front and rear views of SE45 (LX10 AVC) on 17 March 2010, on the dedicated stand for the 300. The third photograph shows SE44 (LX10 AVB) collecting passengers at an awkward angle on Friday 12 March 2010. Note the generic Go-Ahead-London logos, recently introduced, and which are now being rolled out to reduce complications when buses are moved around between the various companies. 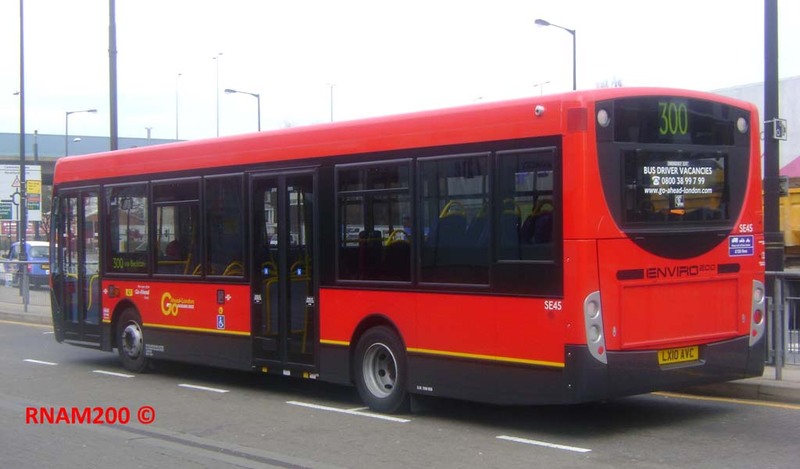 The standard livery of London General/Central, with its welcome black and yellow relief, is also being rolled out at the formerly independent Docklands Buses, as well as Blue Triangle.